Sea ice underneath the Antarctic is thicker than previously thought. This was discovered by a first-of-its-kind robotic survey during two expeditions to the continent by scientists from the US, the United Kingdom and Australia. The expeditions took place in 2010 and 2012. The robot, named SeaBed, mapped an area of ice spanning 500,000 square metre (m) at an underwater depth of 20 to 30 m. The average ice thickness was found to be between 1.4 m and 5.5 m, with a maximum thickness of 16 m, reports The Guardian. 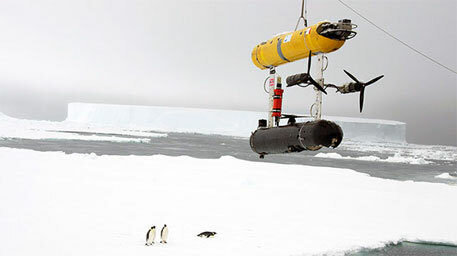 Earlier measurements of Antarctic ice thickness were hindered by technological constraints. No ice-breaking ship had drilled more than 5.5m down into the ice to extract a core for analysis, the report states. The new study has been published in the journal Nature Geoscience. The research team involved has hailed it as a major breakthrough as they believe the findings will provide a starting point to study how ice thickness, and its extent, is changing. Guy Williams, one of the researchers, told The Guardian that the finding is an important step in gauging changes to Antarctic ice. “Sea ice is an important indicator of the polar climate but measuring its thickness has been tricky. This is a game changer because it was previously very challenging to measure ice depth. We were limited to visual observation from the decks of ships or ice cores. It was a lot of hard work and quite crude, which means we were biased towards thinner ice. It was a bit like a doctor diagnosing a condition by prodding the skin,” he said. Jeremy Wilkinson from the British Antarctic Survey agrees. “A lot of effort has gone into measuring Arctic sea ice, and we are now just scratching the surface of Antarctic sea ice, especially in respect to thickness. We want to understand how it is changing and how that integrates with climate and ecosystem changes,” he told BBC, adding that only by bringing all the processes together would the researchers be able to understand what is going on in the Antarctic. Hanumant Singh, working with the Woods Hole Oceanographic Institute, which developed the Autonomous Underwater Vehicle (AUV), explained the challenges of the mission to The Guardian. “Putting an AUV together to map the underside of sea ice is challenging from a software, navigation and acoustic communications standpoint. SeaBed’s manoeuvrability and stability made it ideal for this application where we were doing detailed floe-scale mapping and deploying, as well as recovering in close-packed ice condition,” he said.